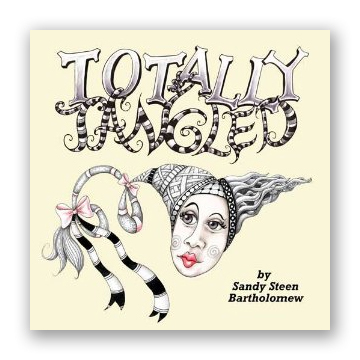 Sandy Steen Bartholomew, CZT [website] just received a great review on her new Zentangle-inspired book, Totally Tangled. There are also many wonderful reviews on Totally Tangled's Amazon page. Yes, a great review. Congrats to Sandy for all that she brings to the Zentangle community. The review also described Zentangle in such a wonderful way. Awesome all the way around! I love that website and I'm not at all surprised that they love Sandy's book! I can't wait for Sandy's next book! Great review of a wonderful book!! I am a virtual tangler. I found Sandy's book on Etsy. It has been a major source of learning about zentangle for me. I now live in Tel Aviv, Israel and between Sandy's books and wonderful videos on the web, I am growing daily in my zentangle practice. Congrats Sandy on the book review!!! Keep up the great work. My daughter gave me this book for Christmas because I had it on my Christmas list. I Love it!! A, B, C, C, D, E, F, G . . .